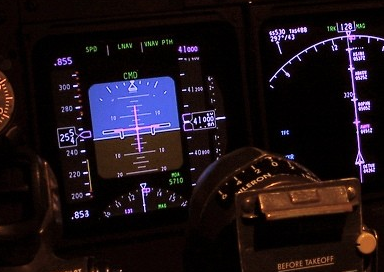 What dictates the shape of the attitude indicator display on the PFD? I notice the atitude indicator displayed in the PFD is either squared-shape or truncated-circle-shaped. They look like a circle whose both right and left sides are truncated to display rules (speed and altitude). In either case, the information displayed are the same (pitch, bank angle, perhaps flight director,...) and are displayed in a very similar manner (including the colors). Those 2 designs exists for years, so there may not be advantages of one over the other. Why one is preferred over the other for some manufacturer, and the other one for other manufacturer? What criteria are taken into account when choosing this shape? A circle makes sense because a physical attitude indicator is round. (A physical one has to be round because it consists of a ball moving behind a window.) It makes the screen display look more like the instrument it replaces, which is good for recognition and familiarity, and makes it easier to judge things like bank angles. A rectangle makes sense because it has to fit on a rectangular screen. You can tile rectangular instruments/displays on a screen efficiently, with no wasted space between them, as your example shows with the tapes. Rounding the corners delineates the edges of the display better than just having abutting rectangles. The full process by which physical cockpit instruments and glass-cockpit displays are designed and laid out is too long to explain here. The main focus is on making it hard to make mistakes, and after that to make it quick to see the most important information. To support this, each instrument has to be easy to identify and to read correctly. Despite the shape difference, the two designs look very similar. Even if you've never flown any of these aircraft before, you'd immediately recognise it as an attitude indicator, and you wouldn't confuse it with a different instrument. Development history, type commonality, and usability engineering. Let's start with the A340 you have. For commonality it borrows from the A320, which borrows from the A310, which borrows from the A300. Quotations and references for the above can be found here: Why does Airbus not display the exact airspeed on the PFD? For the Boeing 747-400, it was a clean slate design, and they made the best out of the initial big screen – the A300's initial EADI (not a full-fledged PFD) was a small screen. The 747 style carried over to the 777. Not the answer you're looking for? Browse other questions tagged aircraft-design avionics flight-instruments glass-cockpit or ask your own question. Why does Airbus not display the exact airspeed on the PFD? How much lag does an Attitude Indicator experience? How does one reset an attitude indicator that doesn't have a cage? Can we replace an attitude indicator with a ball half full of liquid? What Electronic Flight Display is this? Are there common standards for aviation graphical user interfaces? Does SDAC display data for both the PFD, ND and the ECAM display? How does a PFD handle unphysically abrupt changes in the parameters it's displaying? What principle does the attitude indicator in the G1000 use?